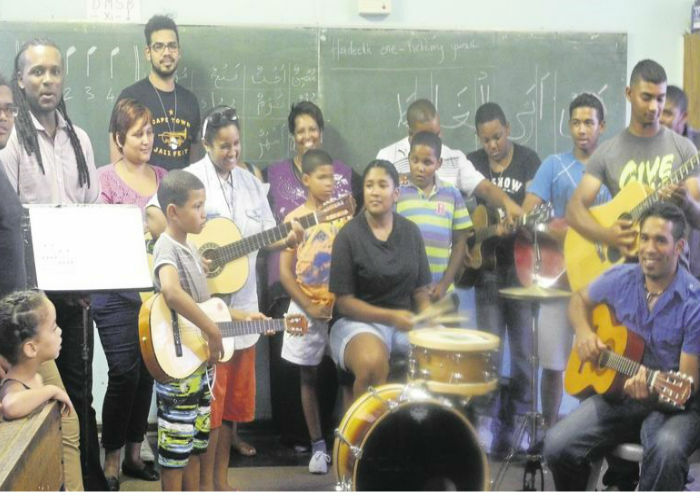 We caught up with self taught musician Trevino Isaacs, who started the Mitchell’s Plain Music Academy. The school is an effort to help turn kids away from gangs and violence, and towards music. Trevino has taught himself how to play piano, guitar, drums, bass-guitar, banjo and the accordion. With just a dream of a music school, he began by giving kids lessons in his mother’s living room. The business then started to grow beyond his expectations, so much so that he had to approach two of his friends that had studied music, with the idea of starting a fully-fledged music school. Due to the academy, Trevino was one of the small business owners selected to take part in the sponsored Small Business Academy (SBA) programme that is offered by the University of Stellenbosch Business School, that is offered for 9 months. He will be graduating from it in November 2017. His music academy follows the Trinity College London syllabus, which is a syllabus that is recognised by all major universities in South Africa and the United Kingdom.